Let’s get the negative out of the way. Yes, Honduras currently holds the title of being the ‘Most Dangerous Country in the World,’ yet there is much more to the country than one bad mark. Most people have done poorly on a test in school, I feel like that same bad experience is what’s keeping a cloud over the beauty that in Honduras. I only had time to scratch the surface, but with that tiny scratch I encountered so many great things. I was likely as fearful of entering Honduras as I was entering any country before it, it’s almost like crossing a state line at this point. A friend and I trekked through three cities and used San Pedro Sula as our transportation hub. 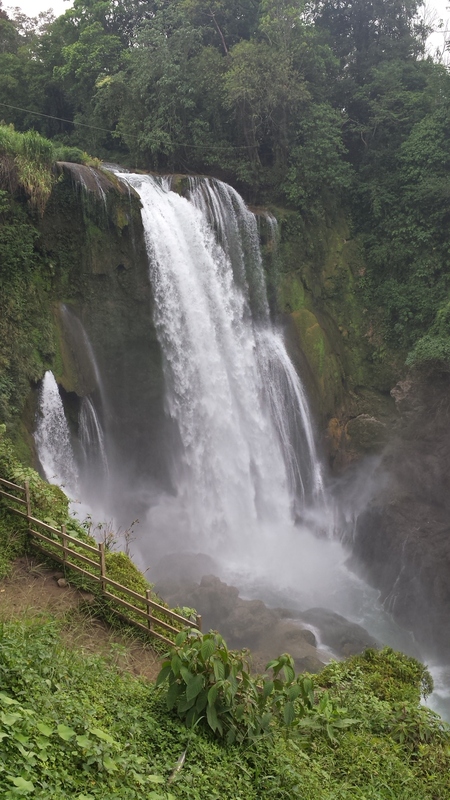 Pulhapanzak Waterfall (Peña Blanca): This was our first stop after we landed in San Pedro Sula. The bus ride to the area was via El Mochito at the San Pedro Sula bus station (we took a cab there from the airport), which is very similar to the dollar vans in NYC or the mini bus service in New Jersey. Vendors hop on and off the bus along the route and you can get fresh agua de coco, fried chicken or platanos. We were planning on using D&D Brewery as a landing place, but that didn’t work out so we just brought our bags to the resort at the waterfall and they watched things for us. Once we got the the park, which is about 15km from Lago Yojoa, we paid our entrance fees and hired a guide. Rafael was our guide and did a great job at getting us down to the waterfall and behind it. My friend can’t swim and was still able to do the waterfall tour. It takes about an hour and is worth the schlep. The bus ride there took about one hour and 45 minutes. Copán Ruinas: We got here pretty late at night after a very long taxi ride from San Pedro Sula, seeing as though the last bus to Copán Ruinas leaves around 3:30pm. Thankfully Hotel Brisas de Copán was very welcoming. We did have a reservation, which orginially with Hotel Acropolis across the street, but all the rooms were booked for the two nights that we needed. We proceeded to pass out and got up well after sunrise. 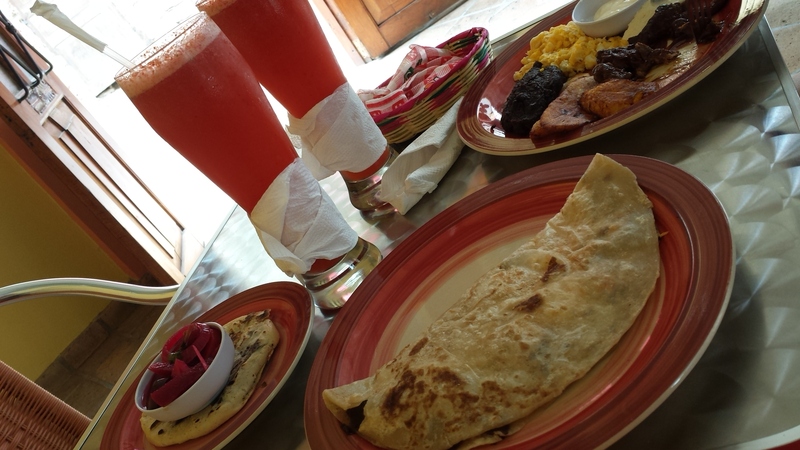 We found a great breakfast at Copán Grills not too far from Parque Central. Baleadas, pupusas y licuados, they have a full menu that will fill you up for a great price. We found a tuk-tuk driver, Cesar R., that agreed to take us to the Ruinas, pick us up after and take us to the Canopy Tours location then drop us back off at our hotel for $7. Deal! The ruins are a great morning trip and we hired a guide to tell us about the ruins. There weren’t too many people at the site and there were some beautiful birds in the area. In the early afternoon I did the canopy tour, it’s worth the $45, which includes the bird park. 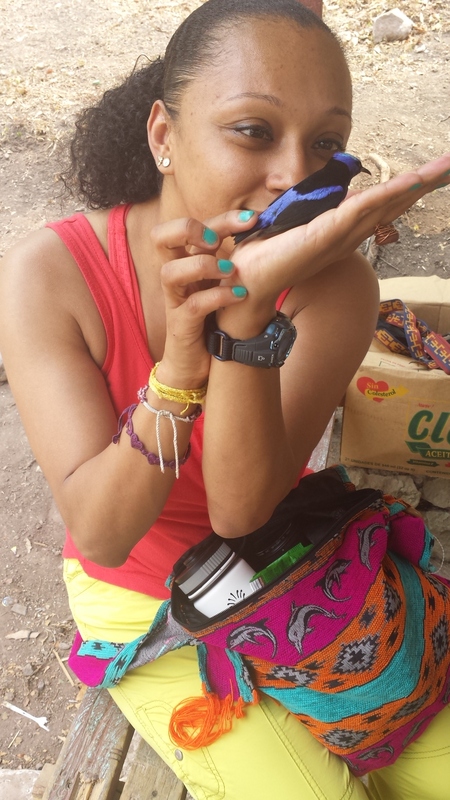 I skipped the bird park, although there was a baby Guarda Barranco at the canopy start point that I helped feed. We spent the rest of the afternoon at a great restaurant and bar, Don Toño’s a few blocks from Parque Central. The owner was completely friendly and it was a great atmosphere. 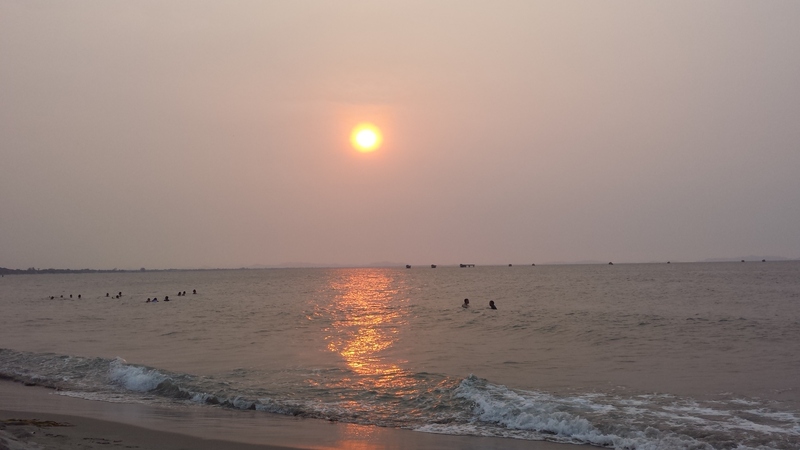 Tela (Bahía de Tela): There are lots of buses towards La Ceiba that stop in Tela from San Pedro Sula. We got to Tela in the early afternoon and paid 60 lempiras for a ride to our hotel, Maya Vista. There are three stops for most buses in Tela and we opted for the second just in case. The hotel is basically the tallest building in Tela since it is at the top of a hill. The bay has great views and you can catch both sunrise and sunset on a clear day, unfortunately we had misty days. Here days are as long and calm as the beachfront. The restaurants close by 9-10pm and the streets are pretty desolate. There are tours that go to Punto Sal y Izopoo, but you need at least six confirmed people in order for the tour to go out so that was out of the question. I think there were maybe a dozen foreigners while we were here. If you are a seafood lover this is the place for you, while folks like me can’t get by on fresh cut coconuts and chicken. Tela was definitely a great place to end a whirlwind trip through Honduras. There are more mosquitos here than I recall encountering in other area. There are things that made each stop similar: the overtaking of vehicles on all roadways, vendors selling items on the side of every road, the love of Pepsi. As dangerous as Honduras is said to be I can say that I didn’t feel unsafe, even after seeing a corpse on the side of the road leaving Copán Ruinas. I’m sure there are tons of things I have forgotten, but I can only say that you should, ‘Visit Honduras,’ as it is a country full of beautiful people and places. Desayuno! Baleada, licuados, pupusa y fajitas. The night before the race I had dinner at Auntie Pasto’s, which was delicious. If you are in Honolulu, it’s worth checking out. I’ve decided that two bottles of beer the night before the race shall serve as my pre-race “good luck” tradition. I opted for two Kona Brewing Company Longboard lagers this time. Since the race starts at 5am I needed to be up by 3:30am so that I could walk to the start with enough time to wiggle my way to the front of the start. laid out my race gear, drank my beer and off to bed I went. The morning of the race I woke up, got dress, ate a quick snack and headed off toward the start line. My strategy for the race was simple, have fun! If I finished under 4:00 I’d be happy. I didn’t notice the humidity initially, although it wasn’t terrible overall. Florida still holds the crown in terms of humidity. The fireworks went off and some of us were off. I wasn’t as close tot he front as I wanted to be so I crossed the start line about 2:00 into the race. I ran with one of the reps for The Stick that I met at the expo. I’d see him pull up to me again around Mile 21 and I reminded him he needed to pick up the pace if he wanted to finish within his goal. There were small crowds through the first seven miles. Once the sun came up the cold sponges at aid stations REALLY came in handy. I took one at each aid station that offered them. More ‘Good Mornings’ and ‘Hellos’ to everyone I passed, including lots of police officers. I was having fun, as hard as it is for some to believe. Time ticked away and one thing I tried to do was learn the Japanese phrase I kept hearing. It reminded me of the word ‘Sabaidee’ which you hear a lot in Thailand. I later found out that is was something like ‘Gambatee.’ Anywho, back to running. Diamond Head was a little more annoying at Mile 24, but there was a bonus. A group of Hashers set up an aid station near the 40k mark, just before the downhill begins. They made sure folks knew they were doling out beer and I gratefully accepted. 2.2km left in this race, Woohoo!!! As I neared the finish I saw a Minnie Mouse, I didn’t want to get costumed so at this point I made an effort to sprint through the finish. The only issue with that is quite a few people slow down just as they get to the clock…. Run through the clock, if you can, please! The mouse got under just before me, but that means I finished also. Second marathon completed in 3:57:08. As the volunteer handed me my finisher beads she said, “You don’t even look like you just ran a marathon. It looks like you could run another one right now.” I smiled, told her, “I just had fun” and headed to the finishers village. My knee was throbbing a tad bit, but I was able to walk on it. Time for my 10 minute shiatsu massage and a few malasadas before spending the afternoon at Lanikai Beach. The finishers village was well organized and had a lot to offer, especially since there were only about 1,200 of us there at the time. Overall the race was nice, as most say it could do for a little nicer view at some points, but it wasn’t terrible. The race director may want to consider making at least one seeded corral so that those who want to run the race can without having to run on dividers and such for the first few miles, the corral signs they use are completely ignored. There is no reason why people should be dodging walkers from the start gun/fireworks. I’d definitely recommend this race to anyone looking to run a destination race just don’t come in expecting a super fast course. Come to have fun! Now to take a few weeks off and let my body recover from all this running! As my flight prepared to land at Tocumen Airport I got my first glimpses of the red soil and a vivid green countryside. From the landscape to the people, everything in Panama appeared to be bright and full of life.There was color everywhere and I loved it. Even the humidity being above 80% the entire time didn’t stop me from wanting to walk everywhere and take it all in. Of course I stopped to see the Panama Canal, explore the Parque Natural Metropolitano and wander through Albrook Mall. My deeper goal was to travel off the beaten path and find those hidden treasures. 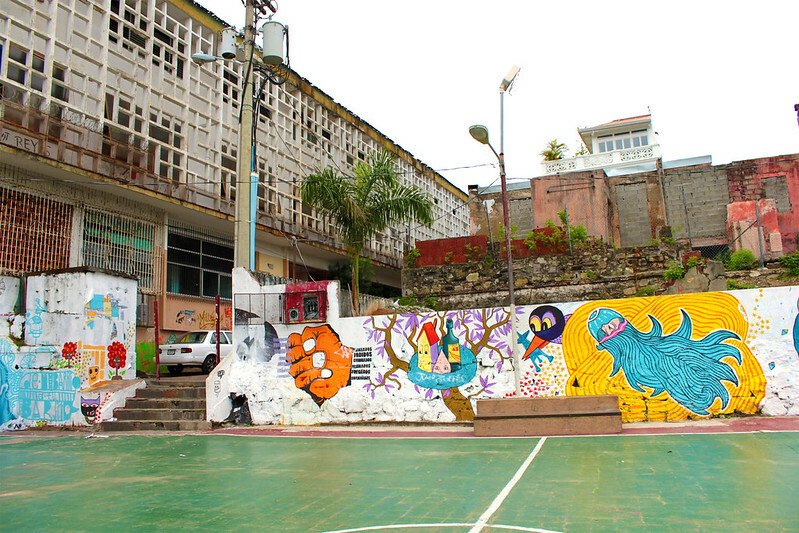 One of my first finds was a graffiti park near Escuela Santa Familia in Casco Viejo. The art may not compare to the works of Banksy or Nick Walker in some books, but it is beautiful, and the Pacific Ocean along the basketball court serves as a great contrast. The colors plastered on the surfaces also liven the school that it is adjacent to. 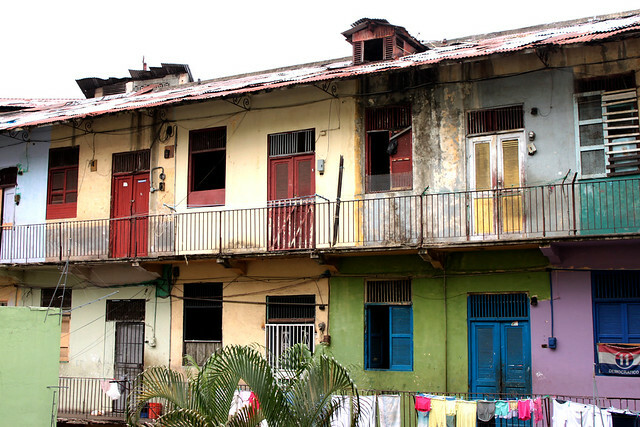 My second find in Casco Viejo were the homes. I should specify that although I liked all of the homes in the area I found that the older homes told a story. There was a contrast that was reminiscent of the tenement buildings during the early 20th century in New York City. The buildings and its tenants were doing everything within their power to withstand the changes around them that would eventually force them out of their homes. In Casco Viejo you see banners on the streets opposing the gentrification that is pushing out the people that have inhabited this seawall peninsula for ages. Some mention that it is somewhat unsafe in Casco Viejo at night, but it is also worth noting that the President of Panama, Ricardo Martinelli, resides there. It’s just as safe as wandering around Paris, Brooklyn, Chicago, or Fes; simply use common sense. My favorite treat was the cab ride from the Panama Canal. The driver took a shortcut through El Chorrillo, which has been documented as an impoverished neighborhood. Its history includes canal workers, Manuel Noriega, the US’ Just Cause invasion in 1989 and Roberto Duran. I stuck my cameras lens out to capture the streets we were passing through without thinking and I’m glad that I was able to capture a part of Panama that will inevitably go through the same changes that are happening in Casco Viejo. Cab rides for only a few dollars, ropa vieja meals for just about the same price and the Panamanian version of Walmart, El Machetazo. This city will give you a lot of bang for your buck. I equally enjoyed walking and shopping along Avenida Central in Santa Ana. If it weren’t for the humidity and lack of a winter season I would consider making Panama more of a mainstay. That and the fact that there is a clear obsession with American fast food chains, but with some effort you can find a fonda and enjoy an authentic Panamanian dish. I would recommend anyone interested in exploring Panama City to go for it, there’s more to this city than just the Panama Canal. When I think of Utah the first thing that comes to mind is the Mormon Church, not Oktoberfest, beer drinking pirates, and Oktoberfest. I was able to enjoy all of that and more. 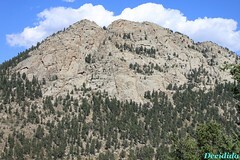 My host arranged to pick me up with a friend of hers and headed over to her place on the east side of Salt Lake City. My hosts boyfriend mad an awesome, spicy quinua and rice dish that I had inside a wheat tortilla. The evening started quietly as we met up with my hosts friend for a little get together at her house north of the temple before walking a few blocks down to a crazy little house party full of interesting people. We stayed out until the wee hours over the morning before crawling into our beds and snoozing parts of the morning away. My only item listed on my to do list was to check out, unsurprisingly, to see the Mormon Temple. Thankfully my hosts went with me and we did an express tour, with Deanne, to check out the auditorium and the roof. The auditorium has an organ with over 700 pipes and seats 21,000 people. It was also pretty cool to know that there is an unobstructed view from every seat because it was built without any interior support columns. We passed through a few halls dotted with original artwork and photos of Apostles from the past and present. The roof, which houses a garden, provides really nice views of the city as well as the other church related buildings which surround it. I found it funny that although the Mormon Church paid into the Prop 8 campaign nobody said anything about my rainbow bracelet, maybe they don’t know what it means. =] The temple, which can’t be entered by many people, took 40 years to build and was completed on April 6, 1893. After our stint at around the temple we headed up to Snowbird Resort, which was hosting Oktoberfest. On the way up I noticed what could have been a controlled burn on the other side of the valley but my hosts boyfriend said that was not common, you couldn’t see much from that great of a distance so I brushed it off. Bier and bratwurst were on order once we arrived and the weather was perfect, making for a great way to continue the day. Pumpkin Ale was on tap, which made me a happy camper. I turned out that National Speak Like A Pirate Day had arrived so there were a bunch of people planning to meet up at a local spot called Bayou and grab a few bites and a few drinks before taking the shenanigans on the road, leaving behind a pirate map for any pirates that showed up after the captain moved the crew along. We jumped ship after everyone settled their bill at the first stop. As we were leaving my hosts boyfriend got a call from his cousin about a fire in Herriman, which was were I had seen the smoke earlier. He called his old roommate and they allowed us to come over, their apartment is on the side of a mountain and they had a clear view across the valley and had been watching the fire. From almost 30 miles away we could see balls of red lights engulfing the mountain in which it had started on. After a couple of hours we headed back to the apartment and started watching movies until we all became a bit too tired and went to bed. My flight was at a decent time in the morning and after my host was dropped off at work I was dropped off at the airport. Another amazing couchsurfing experience and another great time in a new city and state. Now I’m off to experience more of the wild west and specifically the Pacific Northwest. This trip is going too fast but I love it. After a slight hiccup, a tornado and bad weather, in NYC I finally made my way up to the most Northeast state in the US. At this time of night the best, and only way into the city without a ride is a taxi which will run you about $15 to most destinations. 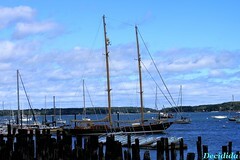 I tucked myself into bed at my hosts house along the back cove and by the time I awoke they had both already headed out to work. They had graciously offered me a bicycle for the day, which is a great way to explore Portland, and I headed out to check out the city and the Old Port before one of my hosts returned from work and was going to ride around town with me. A friend also offered a double-sided page of great information pertaining to Portland since she has lived in the area for so long. Once I had conferred with a map I made my way out of the house and headed towards the back cove and into Portland proper. enjoy some great organic food and good drinks. After a quick stop I cross the street to the East Cemetery. The far majority of the headstones were from the 19th century with quite marked as Revolutionary War soldiers. I have started touring breweries since checking out Magic Hat in Burlington, VT. 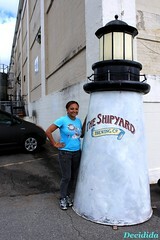 I did a simple google maps search and came across Shipyard Brewery and decided that would be my next stop. I arrived just a few minutes before the next tour was to begin and after enjoyed what may well become one of my new favorite seasonal beers, Pumpkinhead Ale. At this point I let my eyes make my decisions and make my way around town until it was just about time to meet up with my host. A short break later I was back on my mountain bike and we headed around the back cove this time and passed the fort that’s along the shore as well as an area along the coast dotted with islands. We stopped by Waterlily which is a cute shop in the Old Port featuring lots of imported trinkets. I mentioned the fact that I wanted to try grapenut ice cream so our next stop was Beal’s Ice Cream Shoppe. In addition to a scoop of grapenut I added my personal favourite, Coconut Almond! My hosts partner had happy hour plans so we walked over to Corner Room, which features a $3 appetizer/draft beer menu. They also have a few mediterranean items that you can munch on for free. After going back and forth over what to do for dinner we decided to stay at Corner Room although we would have to wait an hour for a table that could accommodate our party. We walked down the block to Novare Res for a quick beer and made it back just in time to be seated. The food was really good, they offer more of an Italian fare, just be sure to ask the prices of items on special. An appetizer salad set one person in our group back $15. On our walk back to our bikes we stopped by a square which fire twirlers and other artists practicing their trades. Portland does not restrict anyone from freely practicing their art or talent which was why the twilers were allowed to publicly use an open flame. 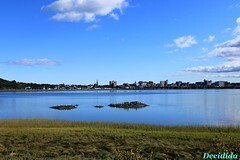 We peddled back toward the back cove and stopped by The Great Lost Bear but only stayed for a few minutes before deciding that we should head back in to be up in time for me to make yet another morning exit. I feel like I quickly become infatuated with every city I visit and this is another one on that list. 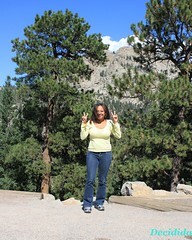 I only had a bit over 24 hours to check out Colorado via the Denver Airport. My initial plans were to go to the US Mint, the Coors Brewery, and the first Chipotle location. I didn’t end up doing any of these things but I feel like I had a great time in Colorado and my experience, although short, was totally worth it. I arrived in the on the late night flight and was picked up and out of the airport shortly after. My host during my time in town had two visitors from France that were traveling around the US for a few weeks. We sat around and chatted for a few hours and decided we would make a day trip out to Estes Park and check out the brewery and potato bag slide there. brewery. They do not offer an official tour, but you can look over to see the operation as you head upstairs to the restaurant that occupies the second floor. Their bottling line fills four bottles at a time. The four of us opted for buffalo burgers and chatted while admiring the beauty that surrounded us. On the way back there was a cute winery near the town of Lyons that we popped into that offers a tasting of five wines for about $3.00. The British woman there was a pleasure and offered a lot information about the winery and upcoming plans in addition to information about the wines they sell. Our plans for the night were to have dinner made by my host’s roommate. We stopped by the local grocery story to pick up additional items in order to make what turned out to be a great apple chicken chutney salad with some toasted french bread. We enjoyed dinner out in the backyard joined by a few clouds and a soft breeze. I washed my meal down with a nice Boulevard pumpkin ale. Back inside we hemmed and hawed about what we would do for the next few hours before I had to board a very late night flight back to the East Coast. Bonnie Brae Ice Cream Shop came up as an option and thanks to their Facebook page we knew we had 30 minutes to make the 10 minute commute to the shop. Once we arrived we saw that all the lights were out and the staff were on their way out the door. Apparently their summer hours have ended but they have not updated their information to reflected the changes. So now we are back to square one and decide that we are going to head downtown to meet up with some friends of my host. Upon arrival we noticed that the bar/restaurant was a bit more upscale that we were looking for so we headed down to the bar on the corner which was advertising $2.00 PBR cans. Dueling Pianos turned out to be a fun time and a way for us to enjoy one last beverage together before I made my grand exit. 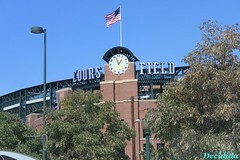 I hope to visit Denver again and this time for a few days rather than a few dozen hours. My final act before I boarded my flight was realizing that I left my hoodie in my hosts car. Lucky for me the two frenchmen that were staying at her house as well are driving to California and will be in the same areas as I will around the same time. Now my hoodie is taking a great American road trip from Colorado to California without my supervision. I hope its having a great time along the way and I look forward to being reunited with it in the coming weeks. I have to say that I have an affinity for accents, even the ones that some people abhor. In addition I haven’t been to the deep south in a while and I almost forgot for a moment that these cities tend to be very humid. I also somehow missed the memo that you can drink 24 hours a day in and on the streets on New Orleans. That puts a lot in a different light. I couchsurfed while in NOLA and had the pleasure of staying on the other side of the Mississippi in Algiers, a great little area along the river. My host was amazing and showed my some great little spots to hang out in my short time there. 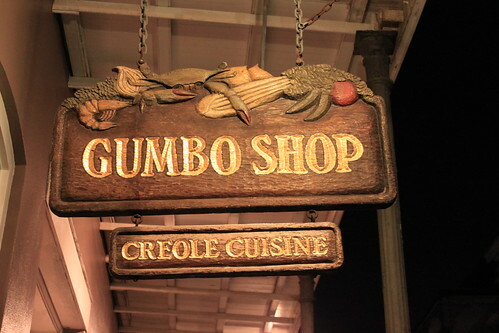 I figured I couldn’t leave without at least trying authentic gumbo so I went over to the Gumbo Shop on St. Peters for my very first bowl. It was definitely good and at a decent price. The Saints are a godsend for this city that was ravished by Katrina just over five years ago. You can still find subtle reminders while simultaneously seeing the progress that has been made by its individuals. I was caught off guard by all the love for the city that is still obviously in despair. Not to mention the people in NOLA know how to party and you can do it 24/7 here! I plan to visit New Orleans again, not likely to watch the Saints play unless it’s against the Patriots but the LSU/Ole Miss rivalry might get me to make a trip! This is a place you have to really experience to truly enjoy, that experience must be beyond Bourbon St. The people are amazing, friendly, and smiling…something that you have to admire.